Join us for this year's genetic design competition, coming to MIT November 3 and 4. Over 600 undergraduate students and faculty from around the world are participating in this year's event. The students will be showcasing the final results of their summer research in the world of synthetic biology - cutting edge research that is producing real tools for scientists. We strongly encourage you to attend to see what this year's teams contribute to the showcase. Previous years have seen such innovative projects as arsenic detectors for use in developing countries, sepsis indicators created from mammalian cells, and ways to produce color and photographs by manipulating bacteria. 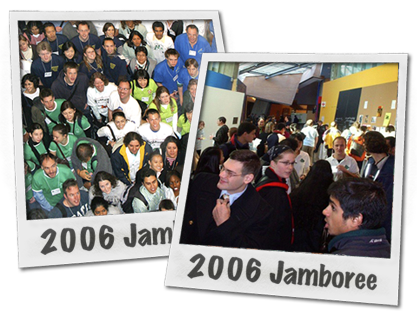 If you're ready to dive into iGEM, make your next stop the iGEM 2007 Main Page. What: International Genetically Engineered Materials competition - aka the iGEM Jamboree. When: Saturday, November 3, 2007 (5 p.m. on) / Sunday, November 4 (8:30 a.m. - 1 p.m.). Teams will be lining MIT's indoor "Student Street" Saturday night at 5 p.m. to talk about their research. Awards will be presented Sunday morning from 8:30 a.m. - 1 p.m.
Where: Stata Center foyer at MIT, 32 Vassar Street, Cambridge, MA. Contact iGEM at MIT dot EDU for directions (and also check out the Jamboree Travel page). This page was last modified on 1 November 2007, at 21:10.